n the United States, the federal funds rate is the interest rate at which depository institutions actively trade balances held at the Federal Reserve, called federal funds, with each other, usually overnight, on anuncollateralized basis. Institutions with surplus balances in their accounts lend those balances to institutions in need of larger balances. The federal funds rate is an important benchmark in financial markets. The Federal Reserve uses open market operations to influence the supply of money in the U.S. economy to make the federal funds effective rate follow the federal funds target rate. The target value is known as the neutral federal funds rate. At this rate, growth rate of real GDP is stable in relation to Long Run Aggregate Supply at the expected inflation rate. U.S. banks and thrift institutions are obligated by law to maintain certain levels of reserves, either as reserves with the Fed or as vault cash. The level of these reserves is determined by the outstanding assets and liabilities of each depository institution, as well as by the Fed itself, but is typically 10% of the total value of the bank’s demand accounts (depending on bank size). In the range of $9.3 million to $43.9 million, for transaction deposits (checking accounts, NOWs, and other deposits that can be used to make payments) the reserve requirement in 2007-2008 was 3 percent of the end-of-the-day daily average amount held over a two-week period. Transaction deposits over $43.9 million held at the same depository institution carried a 10 percent reserve requirement. The nominal rate is a target set by the governors of the Federal Reserve, which they enforce primarily by open market operations. 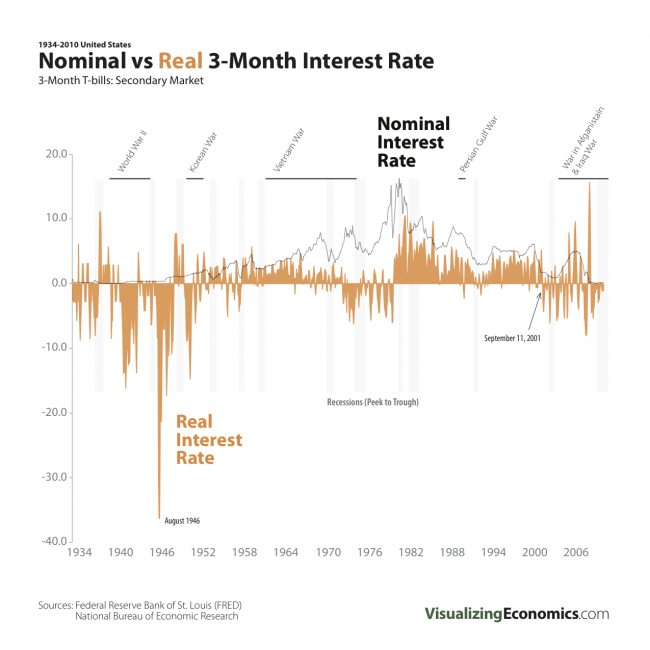 That nominal rate is almost always what is meant by the media referring to the Federal Reserve “changing interest rates.” The actual Fed funds rate generally lies within a range of that target rate, as the Federal Reserve cannot set an exact value through open market operations. Another way banks can borrow funds to keep up their required reserves is by taking a loan from the Federal Reserve itself at the discount window. These loans are subject to audit by the Fed, and the discount rate is usually higher than the federal funds rate. Confusion between these two kinds of loans often leads to confusion between the federal funds rate and the discount rate. 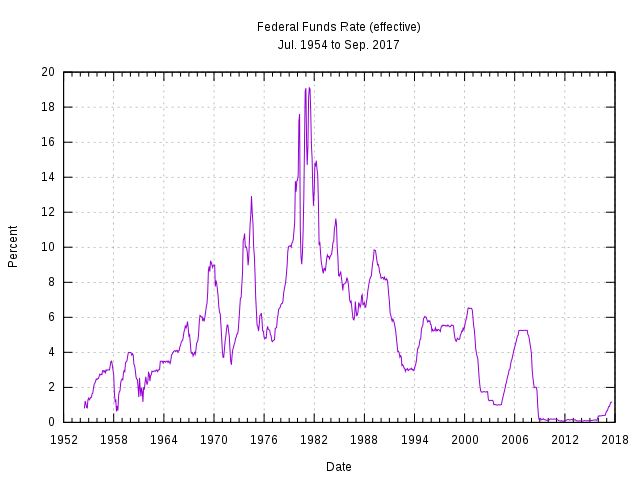 Another difference is that while the Fed cannot set an exact federal funds rate, it can set a specific discount rate. The federal funds rate target is decided by the governors at Federal Open Market Committee (FOMC) meetings. The FOMC members will either increase, decrease, or leave the rate unchanged depending on the meeting’s agenda and the economic conditions of the U.S. It is possible to infer the market expectations of the FOMC decisions at future meetings from the Chicago Board of Trade (CBOT) Fed Fundsfutures contracts, and these probabilities are widely reported in the financial media. Interbank borrowing is essentially a way for banks to quickly raise liquidity. For example, a bank may want to finance a major industrial effort but not have the time to wait for deposits or interest (on loan payments) to come in. In such cases the bank will quickly raise this amount from other banks at an interest rate equal to or higher than the Federal funds rate. Raising the federal funds rate will dissuade banks from taking out such inter-bank loans, which in turn will make cash that much harder to procure. Conversely, dropping the interest rates will encourage banks to borrow money and therefore invest more freely. Thus this interest rate acts as a regulatory tool to control how freely the US economy operates. The (effective) federal funds rate is achieved through open market operations at the Domestic Trading Desk at the Federal Reserve Bank of New York which deals primarily in domestic securities (U.S. Treasury and federal agencies’ securities). LIBOR is calculated from prevailing interest rates between highly credit-worthy institutions. Considering the wide impact a change in the federal funds rate can have on the value of the dollar and the amount of lending going to new economic activity, the Federal Reserve is closely watched by the market. The prices of Option contracts on fed funds futures (traded on the Chicago Board of Trade) can be used to infer the market’s expectations of future Fed policy changes. One set of such implied probabilities is published by the Cleveland Fed. As of December 16, 2008, the most recent change the FOMC has made to the funds target rate is a 75 to 100 basis point cut from 1.0% to a range of zero to 0.25%. According to Jack A. Ablin, chief investment officer at Harris Private Bank, one reason for this unprecedented move of having a range, rather than a specific rate, was because a rate of 0% could have had problematic implications for money market funds, whose fees could then outpace yields. This followed the 50 basis point cut on October 29, 2008, and the unusually large 75 basis point cut made during a special January 22, 2008 meeting, as well as a 50 basis point cut on January 30, 2008, a 75 basis point cut on March 18, 2008, and a 50 basis point cut on October 8, 2008. When the Federal Open Market Committee wishes to reduce interest rates they will increase the supply of money by buying government securities. When additional supply is added and everything else remains constant, price normally falls. The price here is the interest rate (cost of money) and specifically refers to the Federal Funds Rate. Conversely, when the Committee wishes to increase the Fed Funds Rate, they will instruct the Desk Manager to sell government securities, thereby taking the money they earn on the proceeds of those sales out of circulation and reducing the money supply. When supply is taken away and everything else remains constant, price (or in this case interest rates) will normally rise. The Federal Reserve has responded to a potential slow-down by lowering the target federal funds rate during recessions and other periods of lower growth. In fact, the Committee’s lowering has recently predated recessions, in order to stimulate the economy and cushion the fall. Reducing the Fed Funds Rate makes money cheaper, allowing an influx of credit in to the economy through all types of loans. Bill Gross of PIMCO has suggested that in the past 15 years, every time the fed funds rate was higher than the nominal GDP growth rate, assets such as stocks and/or housing always fell. He even suggested that the best way to price the fed funds rate would be 100 basis points, or 1%, below the nominal GDP growth rate.